The last couple of weeks have been very hectic for all of us. It has taken me that long to put any recent pictures on our photo site, so now there are a lot of new pics there. Benjamin turned two on the 27th. Mike and I went to his daycare that day to celebrate with all of his friends. We brought party hats and cupcakes for everyone to enjoy. Benjamin was in love with the attention, especially when everyone sang Happy Birthday to him! That night our friends Eric, Reese and Sidney came over to help us celebrate some more. Benjamin was able to eat a second cupcake that night and was popular enough to receive many singing phone calls and one video call as well. We had his birthday party on the following Saturday, the 30th. Family drove all the way in from Illinois and Wisconsin. We had gorgeous weather, Mike made fabulous food, and everyone had a great time! Sunday was a very relaxing day for all of us. Benjamin spent time playing in his new sandbox and using all of his new toys and we just enjoyed sitting out in the yard without feeling like we had 100 things we should be doing. Benjamin is in his new BIG BOY bed, which he just loves. He has been sleeping so well in it, too. It is hard for us to walk into his nursery and not see his crib, he is growing up soo fast. 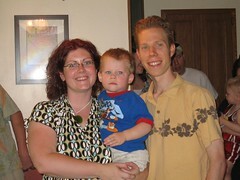 I also uploaded pictures from father's day. We had a picnic at a lake with Mike's parents, Dan and Jennifer. While I was out of town for a work-related conference, Mike and Benjamin went to a party to say farewell to some of Mike's running friends who are moving back to Norway. Benjamin had fun running all over the house and yard at the party. The day before father's day was the annual cemetery walk for Rochesterfest, which I like to participate in. This year I not only played a character, but I also wrote my own script for the day. Basically this involves standing on a grave for about 4 hours in god-awful heat, reciting the same 6 minute script over and over to groups of about 20 people. It is grueling, but I love it. I think that is about it. We are glad to have the month of June be done and gone, as it was a really rough one for both Mike and I. And now we have some exciting things to look forward to in July and beyond: including Erin's baby shower, a weekend away for Mike and I, more camping trips, a huge relay race for Mike, the state fair, and many visits with family and friends.